BUYSOUNDTRAX Records presents the original soundtrack to HARDLY WORKING. 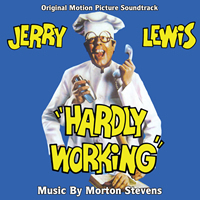 The soundtrack features music composed by Morton Stevens for the 1980 comedy film directed by directed by and starring the great Jerry Lewis, along with Susan Oliver, Deanna Lund, Roger C. Carmel, Harold J. Stone, Steve Franken, Buddy Lester and Billy Barty. HARDLY WORKING tells the story of Bo Hooper, a circus clown who loses his job when the circus closes down and has the worst luck ever trying to hold down a job. Seen as a comeback film after an absence of nearly a decade, HARDLY WORKING gave Lewis the opportunity to debut his style of slapstick and sentimental comedy for a new generation of moviegoers. Morton Stevens was hired by Jerry Lewis to score the film and while he provided slightly comic or light-hearted music to accompany some of the film’s comedic set pieces, he avoided writing specific comedy music and chose to focus the score’s arc on the dramatic elements of the story. Steven’s central theme for Bo, apart from its introduction early in the film, is thoroughly heartfelt and captures the essence of the character. Lewis was so pleased with the score that he even took to the podium during one of the scoring sessions and conducted the orchestra during a couple of cues. Born In Newark, New Jersey in 1929, Morton Stevens studied composition at the Juilliard School and became the arranger and later, the musical director, for Sammy Davis, Jr., Frank Sinatra, Dean Martin and Liza Minnelli. He also served as music director for CBS and was a prolific composer and arranger for television for over 30 years. Best known for the famous theme music for HAWAII FIVE-0, for which he won two Emmys, Stevens contributed music to many television shows, including GUNSMOKE, POLICE WOMAN, THRILLER, WAGON TRAIN, THE MAN FROM U.N.C.L.E., CIMARRON STRIP, THE WILD WILD WEST, TINY TOON ADVENTURES. Stevens also served on the board of directors for the Academy Of Television Arts And Sciences. Surprisingly, he only scored a few feature films including ACT OF PIRACY, THEY STILL CALL ME BRUCE, CRACKING UP and THE RAIDERS. A great deal of the composer’s output has not been released on record or compact disc. BUYSOUNDTRAX Records presents the world premiere soundtrack release of HARDLY WORKING, featuring music composed and conducted by Morton Stevens, including the complete orchestral score, along with the source music composed for the film as bonus tracks, professionally mastered by James Nelson of Digital Outland. The booklet contains liner notes written by noted author Randall D. Larson and includes comments from producer Igo Kantor.